Considering that this hotel was built in 1889 and that it replaced an earlier hotel on this site it's a wonder that I could only find one older photograph of it. Here it is, relatively late in the piece and flying the "backpackers" flag, in 1989. This structure was designed by George W Campbell-Wilson who designed a couple of other suburban pubs also. 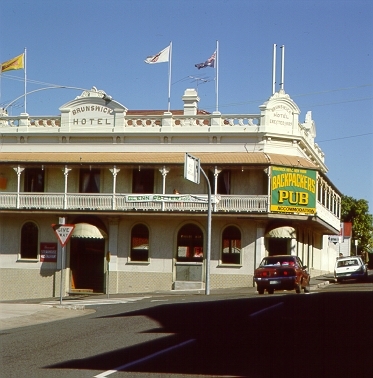 It is similar to other Brisbane hotels of the period, with wide verandahs and ornate cast iron features. I haven't been inside, although I pass by it quite frequently. I understand that it has retained its suburban pub roots inside - the last major refurb was towards the end of the fifties. People seem to be divided on whether or not that is a good thing. Apparently the public bar evokes the men-only atmosphere of that period with regular barflies in their customary corners. But it seems that work has been done on the menu - people report pub food of quite good standard at reasonable prices. The Brunswick stands diagonally opposite the Rivoli Theatre that we looked at recently. It is at the start of the New Farm suburb, quite close to the city. There is something typically Australian about this Victorian pub - the corrugated iron veranda covers, the slim columns and gorgeous iron lacework, the corner position. I don't know that I would eat food in a pub, but for drinks and socialising the atmosphere is unbeatable. There are a couple of pubs in this area that serve excellent food. I quite enjoy a good counter lunch occasionally, especially if accompanied by a cold draught beer and a chat with a mate. What I don't enjoy is having to walk the gauntlet of smokers to enter an establishment. You can see a couple in the photograph. What is the collective noun for smokers - a miasma? Wow - thanks Crissouli. I'm honoured! I have been called up for jury service which may have my computer time blocked out for the next couple of weeks but I'll follow it up ASAP. My Grandfather Alf Martinez, owned the Brunswick Hotel and lived there in the last couple of years of his life until he passed away in 1980. He refurbished the hotel in the late 70's adding a steakhouse which was very popular at the time. I think he bought the pub in the sixties, when it was a regular haunt of navy servicemen from the base at Teneriffe. When there was a workers strike I remember all the family were called to come in and help run the pub. we own a unit that is behind this that faces the river. The back windows over look the hotel. We call the guys who stand on the corner smoking " the fellas" and it annoys me that the bottle shoppe is gone while construction is ongoing.